This time of year, for most of us living here in the Northeastern United States, the thought of a California sunrise, 70 degree afternoons, and a few curvy canyon roads is the daydream that keeps us trudging along through the confines of Winter’s cold embrace. Scorpion heard our proverbial cry, and is releasing a new graphic in the EXO-R710 lineup for just the occasion. Pinstriping was born to Southern California during the 1950’s and lives on in the Scorpion EXO-R710 Golden State Helmet. This new graphic from Scorpion features a two-tone Matte Black base layer with various shades of gold appliques. A California Grizzly descends from the rear of the helmet onto a California coastline. The graphics are rusticated to compliment the vintage flare of this helmet. Home for this guy would be ripping around on the scenic twisties of Angeles Crest or the PCH. 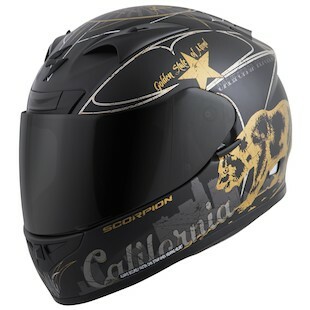 All riders elsewhere can rock this helmet to represent their California dreamin'. With the new riding season fast approaching, gear up with style with the new Golden State helmet from Scorpion.